Off-Season hours: Monday, Thursday & Friday - 3 p.m.-12 a.m.; Closed Tuesday-Wednesday; Saturday & Sunday, 12 p.m.-12 a.m.
the Big Game and the best nightlife in Corolla! Located in Corolla, part of the Outer Banks of North Carolina, Sundogs is a family-friendly restaurant perfect for lunch and dinner regardless of your party’s size. Sundogs is plenty spacious and can accommodate several large parties at once. We proudly offer an array of mouthwatering appetizers along with tasty steamed seafood, crisp salads, sensational sandwiches, fantastic burgers and excellent entrees including jambalaya, seafood, ribs, and others, all prepared by qualified chefs. A children’s menu is also available. Don’t forget to check out our raw bar featuring crawfish, mussels, crab legs, shrimp and several varieties of oysters. We also offer the best late night menu in Corolla that runs from 9:30 pm until 1:45 am that features classic bar food items like wings, chicken tenders, and mozzarella sticks. Sundogs is THE place for the game! Our Corolla Restaurant is open year ‘round and offers MLB, NFL, NBA and NHL games on our 13 large flat panel TVs and jumbo projection TV. Whether you’re looking for ESPN College Game Day, The Big Ten Network, Fox Sports Channels, NHL Center Ice or the NFL Sunday Ticket, we’ve got it! Regardless of your team affiliations, our phenomenally friendly staff will have you feeling like part of the Corolla family before you leave! We also feature a fully stocked bar where you can just hang out and shoot the breeze. 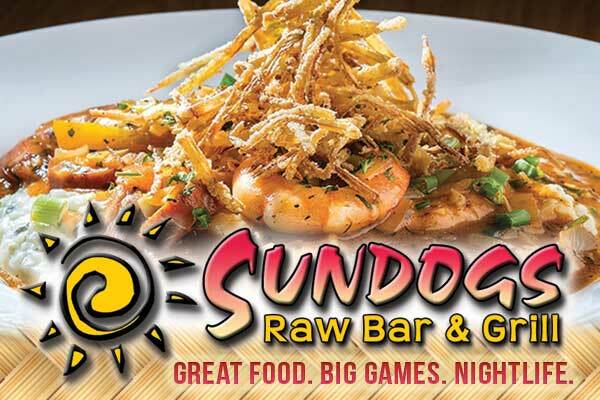 Sundogs is a family friendly style restaurant from 11 am until 9:30 pm and then it's Corolla's hottest spot for 21 and over nightlife!! Between the ambiance that our restaurant creates and the family style atmosphere our staff provides, it won't be long until you're buying a Sundogs souvenir shirt.